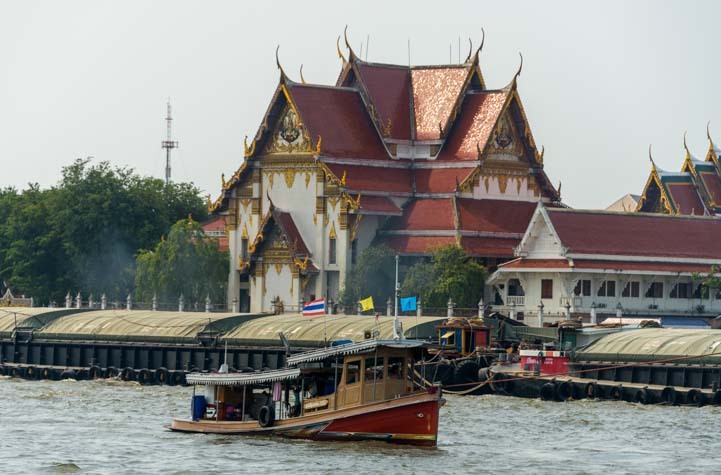 One Day in Bangkok – A trip on the Chao Phraya Tourist Boat! 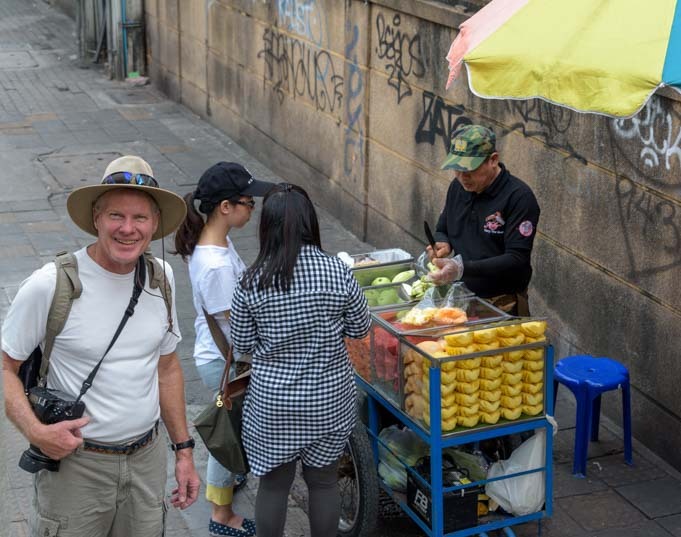 January 2017 – When we moved off our sailboat and back into our trailer three years ago, the main reason we ended our sailing cruise of Mexico was that we’d found exotic travel to tropical destinations was a lot easier by airplane than by boat. Many of our dream destinations were hard to get to in a sailboat! Yet, the last exotic foreign destinations we’d visited were all in Mexico during that cruise. We hadn’t made good on our promise to ourselves to get on planes and fly to cool places! So, last week we hopped on an airplane and flew to Bangkok, Thailand. We will be touring around the country for a month. This was all news to us when we started thinking about going to Thailand a few months ago, as the only thing we knew about the country was that everyone we’ve ever talked to who’s been there absolutely loved it. 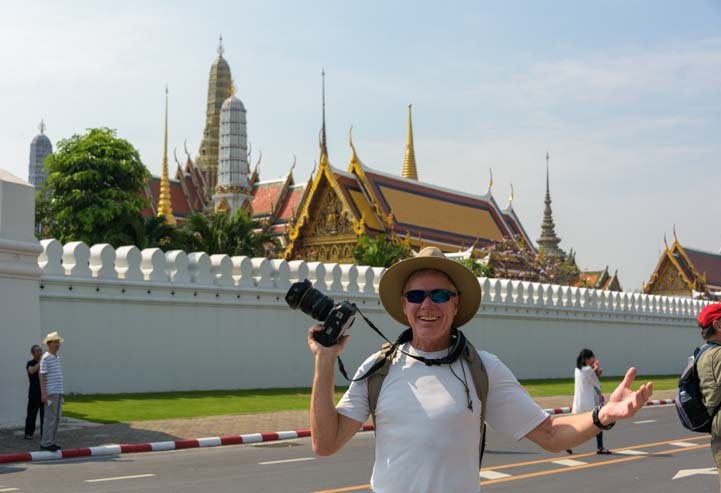 RVers we met in Montana last summer told us about the many happy winters they’d spent visiting Thailand, and a loyal reader of this blog who has lived in Thailand for 10 years encouraged us to throw caution to the wind and check it out. 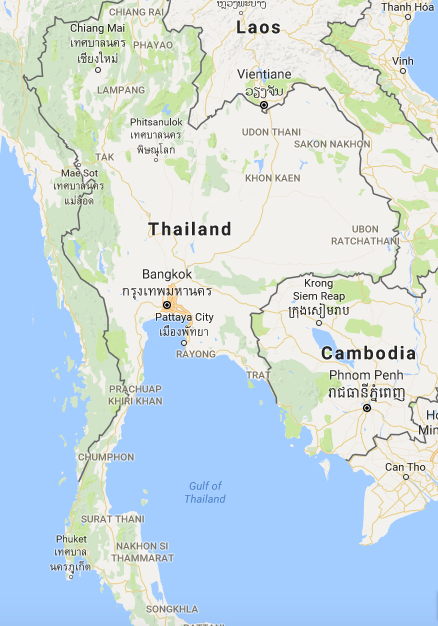 So, I jumped into researching places to go in Thailand and came up with a four week plan that will hopefully introduce us to many beautiful facets of this country. Of course, the first hurdle to all of it was getting through 28 hous of travel door-to-door. When we stepped off the plane in Taipei after 13 straight hours in impossibly tiny seats (the width of the seats, from armrest to armrest, was the length of my forearm from elbow to fingertips), we were bleary eyed. But how exciting it was to realize we had actually arrived in Asia! 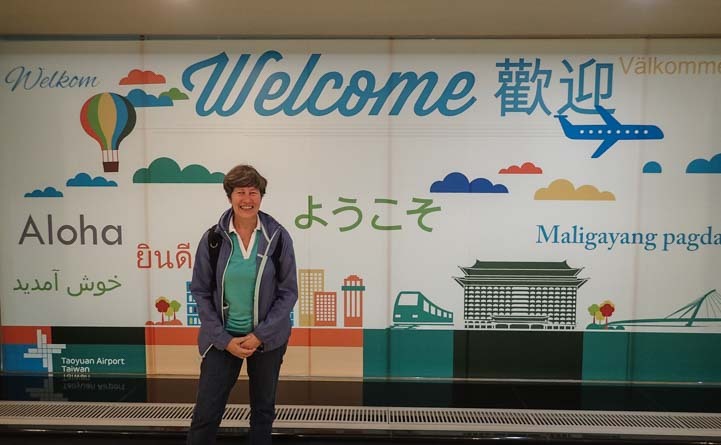 We landed in Taipei, Taiwan, for a layover – We’re in Asia! 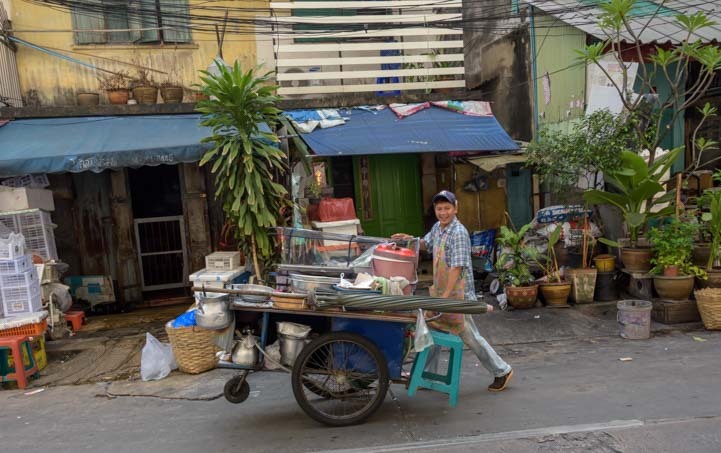 Once we finally got out on the streets of Bangkok, stumbling all over ourselves from lack of sleep, we were instantly caught up in the vivid sights and sounds and smells of downtown Bangkok as scooters, buses, tuk-tuks and intrepid bicyclists jammed the streets around us. It felt like we were back in Mexico, except the writing on the signs was totally different! Thank goodness for the hints in English! We’ve been told that Thailand has two seasons: Hot and Hotter. We were there in the Hot season of January, so the daily highs were a balmy 90 degrees with 70% humidity, quite a change from the cool and dry Arizona desert climate in mid-winter. The locals were all cool as cucumbers, though, and motorbikes lined up at every Intersection as if they were at the startling line of a race. Motorbikes lead the pack in Bangkok’s notorious traffic. Street vendors were selling food and drinks of all kinds and exotic smells filled the air. 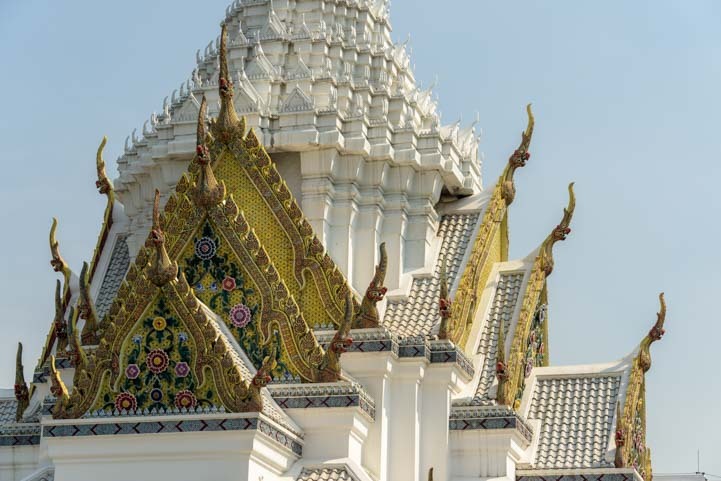 Bangkok is known as Krung Thep (กรุงเทพ), or the City of Angels, just like Los Angeles. But an aspect of its soul may be closer to Las Vegas’ Sin City. I found myself humming the 1980’s son, “One Night in Bangkok” and looked up the lyrics and YouTube video only to learn that it was written for the musical “Chess” and talks of the irony of a nerdy international chess tournament being held in this city of sensual pleasures. 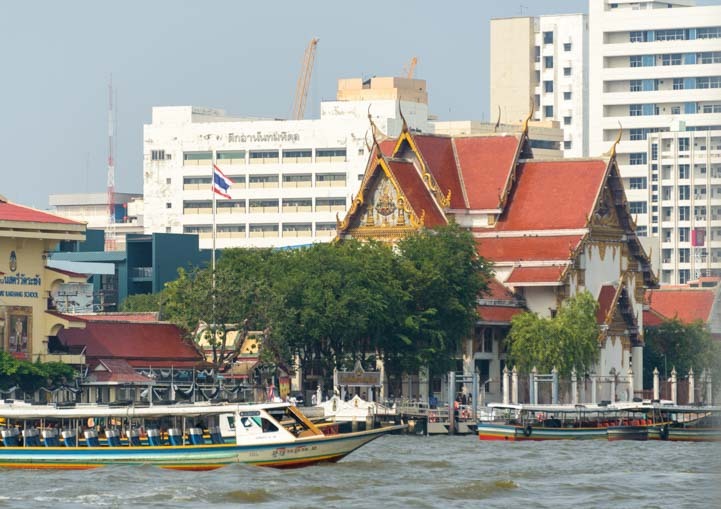 A hundred years ago or so, Bangkok was considered the Venice of the East, as it was built on a canal system and everyone got around town by boat. On our first full day in Bangkok, we wanted to get an overview of the city as it looks from the water. 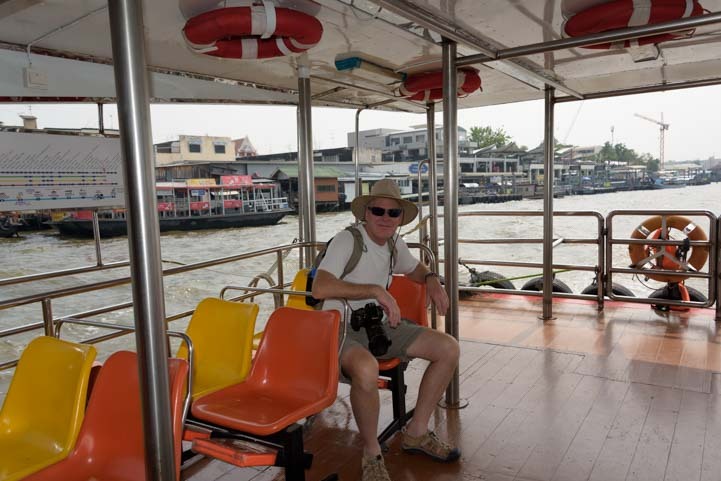 So we took the Skytrain from our hotel to the public boat pier on the Chao Phraya river near Saphan Taksin station. 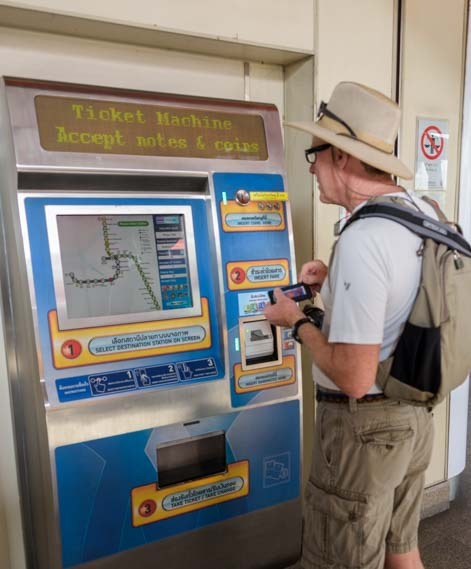 Mark made his way through the many buttons on the Skytrain ticket machine, and we joined the throngs that travel through Bangkok by train everyday. Bangkok’s Skytrain is super easy to use. Chao Phaya Tourist Boat is a hop-on-hop-off ferry system that is just 150 Thai Baht (about US $4.50) per day. Perfect! Within moments we were out on the water. Boats of all kinds were zooming up and down the river. There was so much boating action that the water was choppy from all the wake! 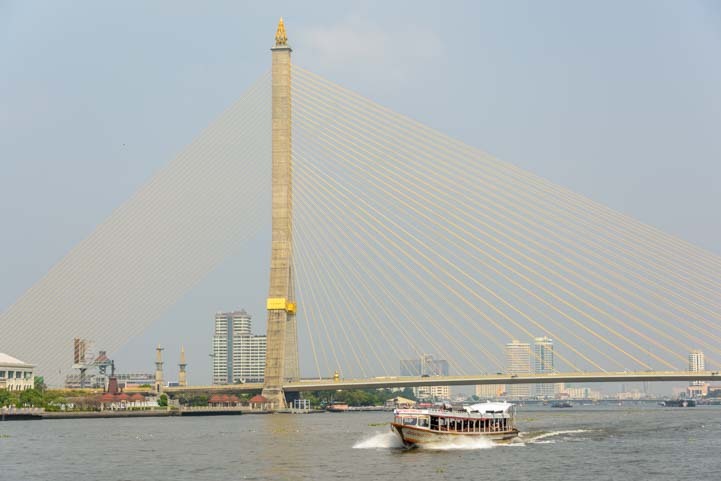 Bangkok’s Chao Phraya River is busy! But the sights — oh my. Between the temples and highly ornamented buildings on the shoreline and the exotic boats plying the water of the river, we knew we had arrived in another world!! We loved the classic images that surrounded us on the Chao Phraya Tourist Boat ride. Thailand is a monarchy, and the much adored King Bhumibol Adulyadej (formally crowned King Rama IX of the Chakri dynasty) who ruled the Thai people for the last 70 years just died in October at age 88. Images of him, his 65 year old son who will replace him, and his wife are absolutely everywhere. 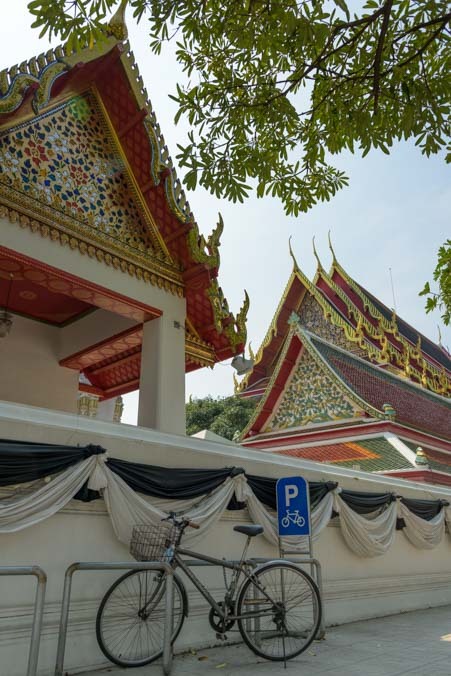 From splash screens across Thai websites to shrines in front of businesses built in his memory to billboards on the highways to the black pins and black clothing that many Thai people are wearing for a year of mourning, the sadness of this man’s passing is ever present. 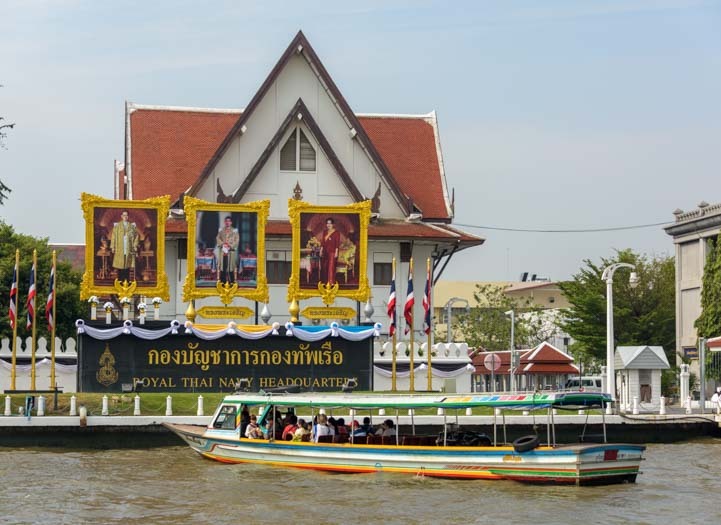 On the Royal Thai Navy Headquarters building we saw portraits of the royal family. Portraits of the royal family at the Royal Navy Headquarters. There were all kinds of unusual sights to be seen all along the river’s edge. In the distance, we saw the spires of the Grand Palace appear over the rooftops. Grand Palace spires peak over the roofs. We got off at this stop to explore a little. 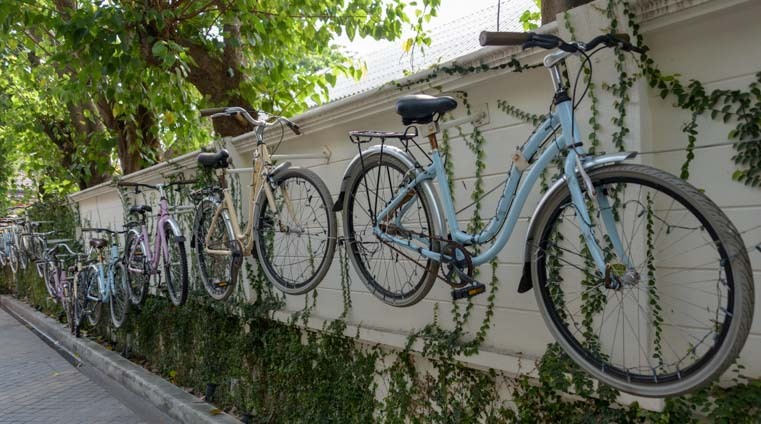 As we made our way from the pier to the main street, we passed a creative display of bicycles hanging on a wall. The throngs of tourists surrounding the enormous city block that makes up the Grand Palace was intense. It was a Saturday, and thousands of people filled the streets in all directions. Many were Asian tourists led by a strident person out front holding a flag high in the air to keep the group together. 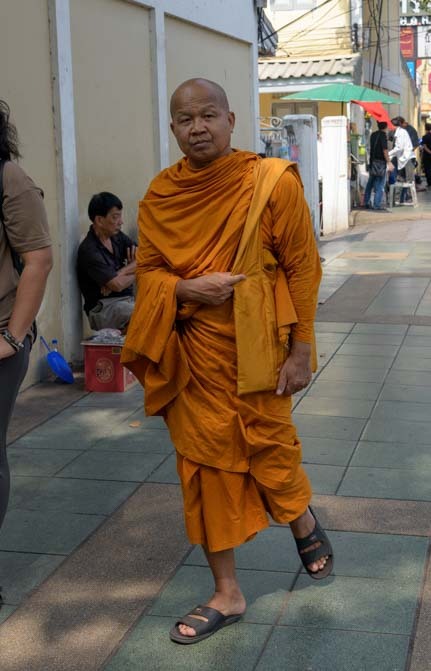 A passing Buddhist monk caught my eye. 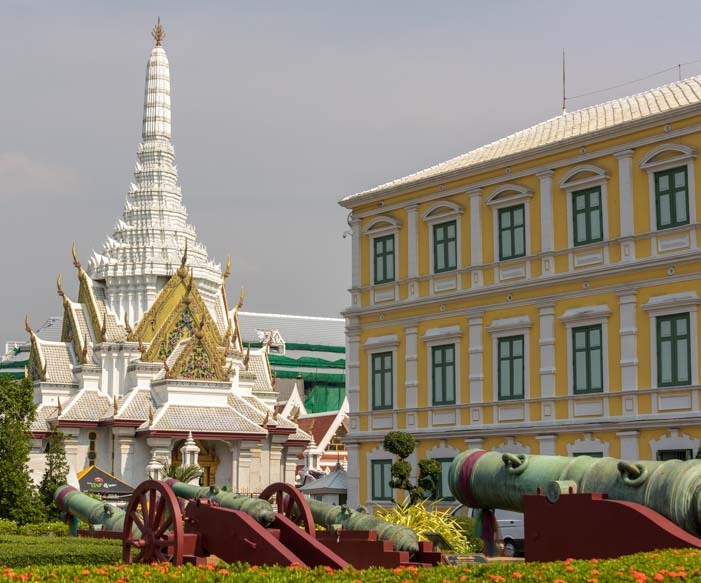 The Grand Palace was built in 1782, and the spires of its many buildings in the complex rose above the high white wall that encloses the palace grounds. Mark and I had to laugh as we snapped endless pics. Two days earlier we’d been boondocking in Arizona. Now we were in Bangkok! OMG – We’re in Thailand!! In order to approach the entrance gate to the Grand Palace, we had to show our passports and walk through a metal detector and get wanded. From there we moved into a massive line outside the gate to buy tickets. 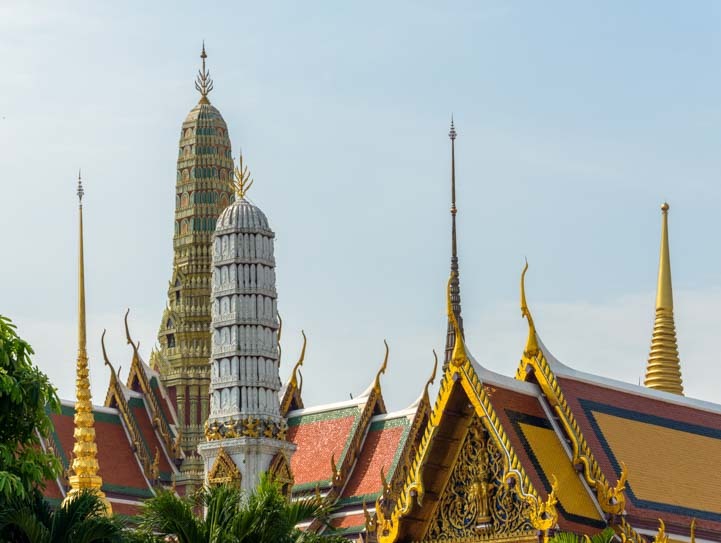 There is a strict dress code for visitors to the Grand Palace — elbows and knees must be covered — and even though officials would lend us cover-ups, our hearts weren’t into touring the palace just yet. There was still so much to see on the river. So, we made our way back to the Chao Phraya Tourist Boat at the pier where a breeze on the water made the sultry heat bearable. Up ahead, a public ferry boat passed us as we approached one of the modern suspension bridges that crosses the Chao Phraya River. These boats are just 40 Thai Baht (about $1.15 US) for a point-to-point ride, and we saw a few foreigners (“farangs”) taking these ferries. But to us, the few dollars more for an all day hop-on-hop-off pass on the tourist boat was worth every penny. A public ferry boat is dwarfed by a towering suspension bridge. Compared to the public ferries which were packed, there were no lines at the piers for the Chao Phraya Tourist Boats. The wait for a boat was never longer than a few minutes, there was always plenty of room on the boat, and we could listen to narration about what we were passing on the shore. The “hop-on-hop-off” tourist boat wasn’t crowded and we never had to wait long to catch it. 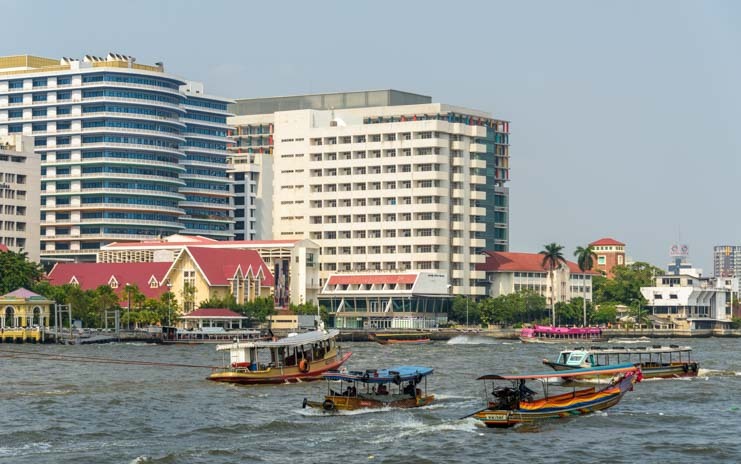 As we floated along the river, we loved the juxtaposition of the old style boats, the historic Thai temples and the modern highrise business buildings. Reflections: Old meets new and East meets West. Views from the river in Bangkok. Getting out on the river is a great way to see the shore. 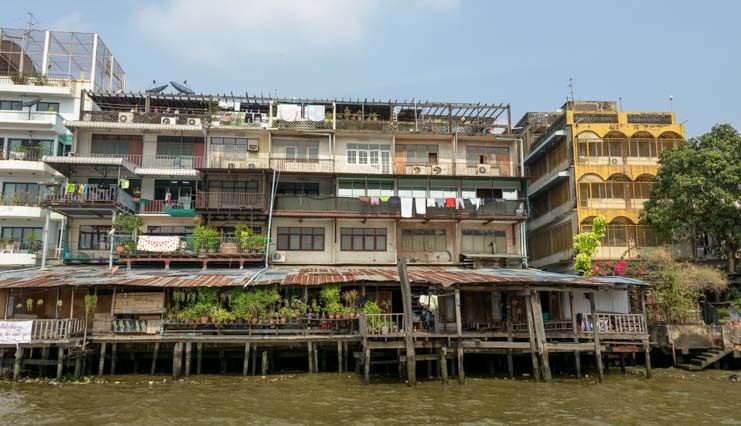 Lots of people live on the river’s edge, and we passed a few housing blocks where laundry was hanging out to dry. 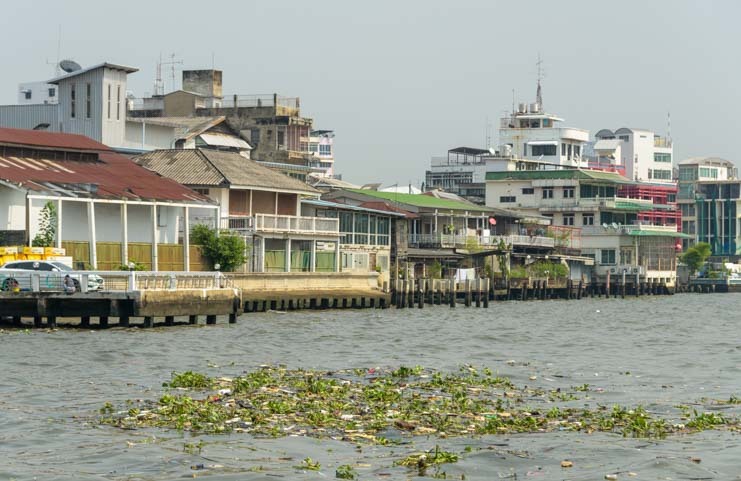 The Chao Phraya river is very dirty, and a few large patches of leaves and debris floated past. 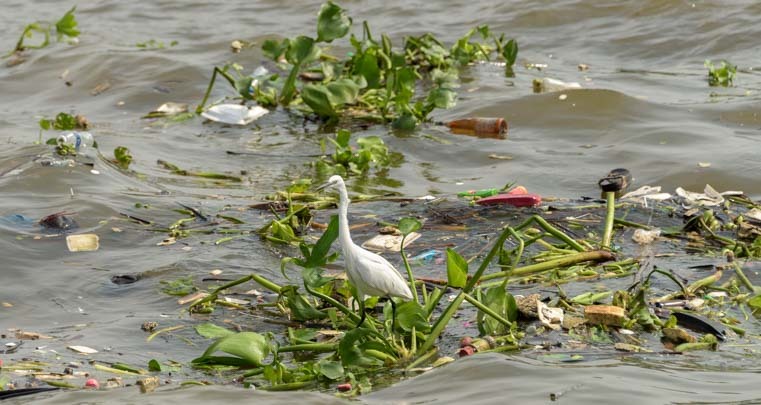 One man’s trash is another man’s treasure, though, and we noticed an egret standing in the middle of one debris pile. 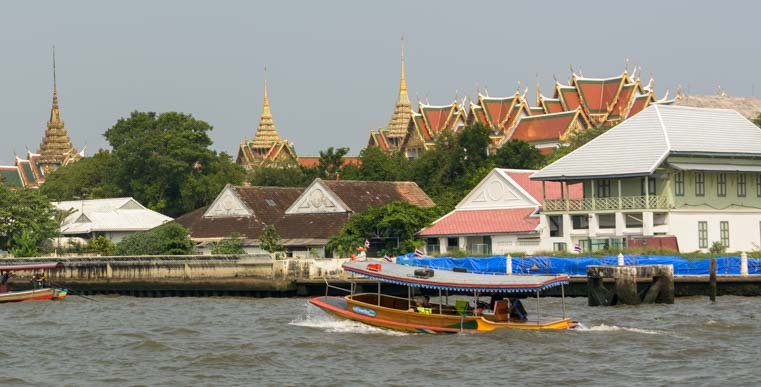 There are dozens of ways to get out on the Chao Phraya River in Bangkok, as many of the big city hotels offer their own tours for their guests and private longtail boats offer tours not only on the main river but onto some of the smaller canals too. Tourists can take rides on longtail boats and float up some of the smaller canals. These private tours can cost as much as 1,600 Thai Baht, or about $45 for an hour of driving around. For us, the Chao Phraya Tourst Boat with its all day hop-on-hop-off service was a much better deal! Longtail boats offer private rides. 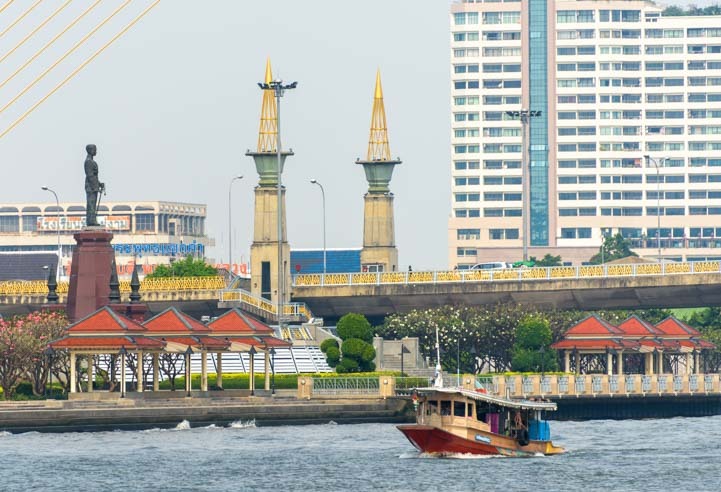 Getting out on the water in the Chao Phraya Tourist Boat is a great way to get an overview of Bangkok. 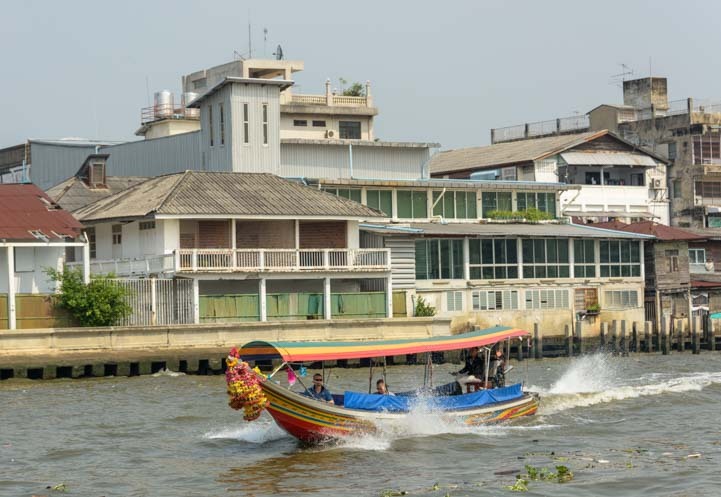 The Chao Phraya Tourist Boat makes 8 stops along the river. 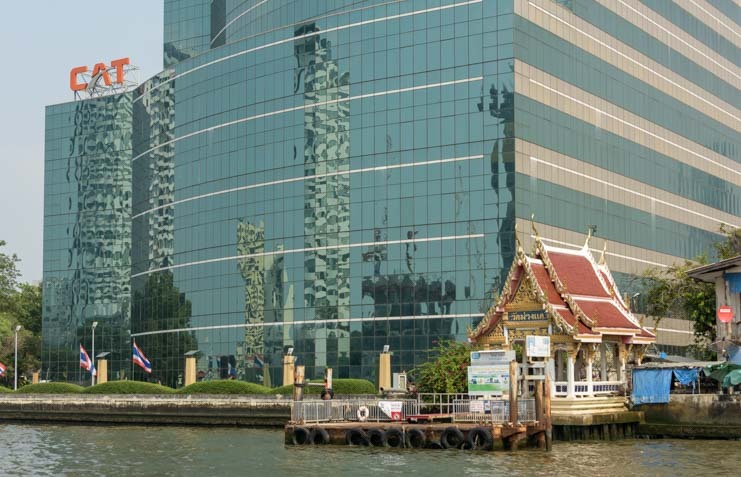 We started at the Sathorn Pier near the Saphan Taksin BTS (Skytrain) station (station #S6). After getting off the train, we simply walked down to the street level and asked a BTS station official which way to go to get to the pier. After a short walk to the pier, we walked past the enormous line of people waiting to take the cheaper ferry boat and ignored the many vendors selling expensive longtail boat rides and made our way to the well marked “Tourist Boat” loading dock at the end. BTS Skytrain map. 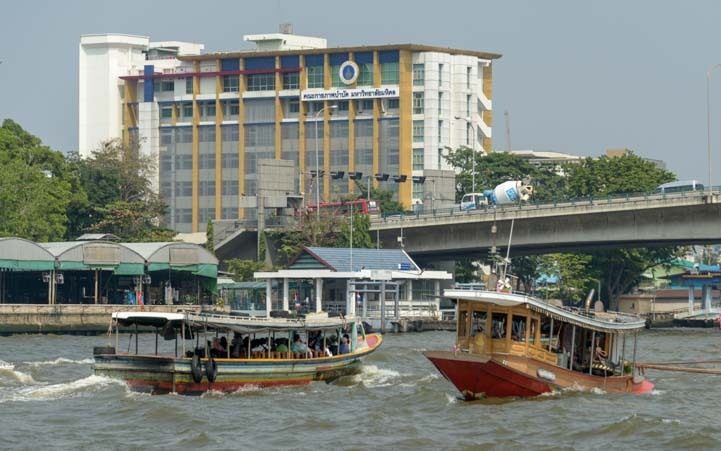 Chao Phraya Tourist Boat stops at Sathorn Pier next to Saphan Taksin station (S6) on the southern line. WOWSA…an all NEW, BRAND NEW ADVENTURE !!! A bit different from those long-ago adventures in the Caribbean 🙂 Love the contrasts and can’t wait for MORE !!!! It is a real thrill to mix it up a bit and expand our horizons!! Looks ike a fun adventure! Bangkok looks much more modern than what I expected. Thanks for sharing the pictures, looking forward to seeing more of the country. Enjoy! 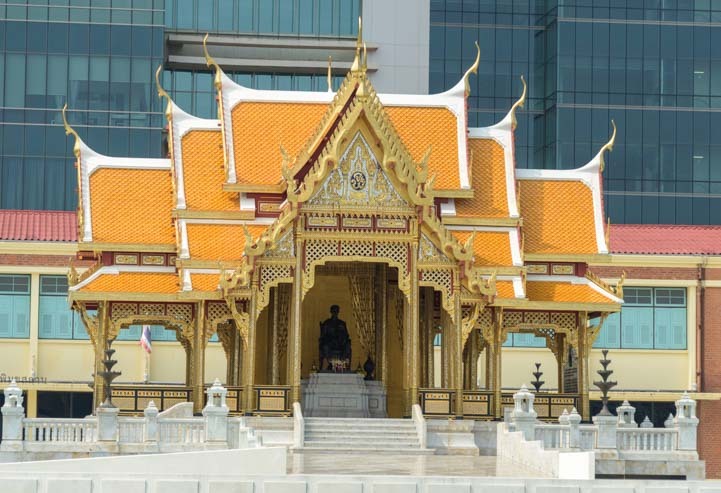 Bangkok is a very modern city of 6.5 million people that has wonderful hints from the past. We spent a week in Thailand two years ago. Loved it and your beautiful photographs took us back to that wonderfully welcoming city of Bangkok. 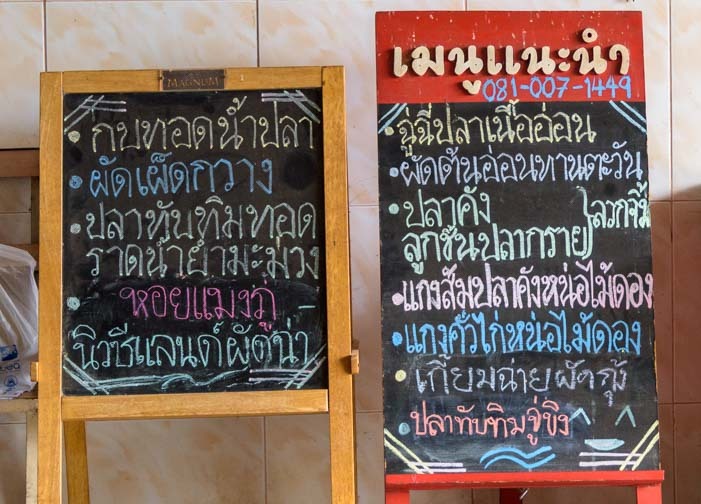 Have a wonderful month of Thai adventure…and food! We are really enjoying ourselves and our intro to life in Asia!! Wow, certainly a tad bit off the roads less traveled! Always enjoy reading your travels to great places! Please be safe there. We love getting off the beaten path, and being able to put the buggy in storage easily and slip away on a plane is a great aspect of RVing full-time!! Glad your having a great time in Thailand. I visited Southeast Asia many years ago and found it very interesting and beautiful in some areas. We used to spend a lot of time down at the Saigon docks picking up merchandise that the big freighters would bring into port. The fish market did not smell very good but the fruit and vegetable markets were always colorful and fun places. ENJOY! We are so glad for our years in Mexico, as much of the grittier aspects of life in Thailand are very familiar to us and have a certain charm. We’ve discovered some fabulous fruits we’ve never heard of before!! Looks like a wonderful adventure. Keep the photos coming. Thanks for sharing. You two are getting a lot done considering you must be experiencing heavy jet lag. Way to go! We just ran around on no sleep for a few days. Too exciting to hang around in a hotel room in bed!! We’re finally catching up on sleep now, a week later!!! Great memories, Jim ! It’s a very special place, and even though I’m sure it has changed tremendously since you were there, it seems to leave a vivid impression on everyone that visits. Great pictures and commentary. I feel like I am traveling in Thailand too! Looking forward to more of your adventures in Thailand. On another note, we are going to the dentist in Mexico next Tuesday after reading your article. Have fun and keep up the commentary and great photos. Thanks, Liz. We’re having lots of fun with our cameras here. Enjoy San Luis!! It’s a big beautiful world out there! Perhaps our trip will inspire you to go to Thailand some day. Wow! I am so impressed by your photos. My husband and I have wanted to go to Thailand for years! Where are you staying? Is lodging expensive? In Bangkok we stayed at the Sukosol and I’ll give more info about it in the next post. We are going to average $30 to $90 a night for our rooms on this trip, and all our hotels (except the Sukosol) have been rated “Exceptional” by agoda.com. I’ll be posting a detailed article of travel and booking tips to help anyone planning a trip to Thailand.